Growing up on the border of Virginia and North Carolina, I learned quite a bit about the Civil War, most of it revolving around the mantra: “The South will rise again!” and the notion of Northern aggression. But why it fell in the first place is a question that not one of my peers who proudly attached Confederate flags to their trucks could answer with full confidence. “It was slavery!” they would exclaim, “The Northerners wanted to take away the backbone of our economy!” Funnily enough, most of these proud Sons of the Confederacy were Northern transplants with parents in the military stationed at Norfolk or Oceana. Nevertheless, it isn’t just in sweet old Chesapeake (boasting proximity to the famous Battle of Ironclads in 1862) that slavery was the accepted answer for why the Civil War happened. In his article entitled “What Caused the Civil War?” Edward Ayers explains why, as a society, we accept the most simple and sensible answer as legitimate. He then explores the truly multifaceted answer of what really caused the Civil War and why it happened when it did. Ayers begins the piece with recapping a scene from The Simpsons where a character is asked to answer the question of what caused the Civil War. He begins to explain it in detail, but is interrupted and asked to just say slavery. With the use of this cultural staple, Ayers reiterates his point that we know the Civil War was caused by more than just slavery, but we’ve accepted it because there are so many correct answers, but slavery is the easiest for us to understand. Ayers addresses the difficulty in reaching a consensus on a comprehensive answer by exploring two different schools of thought: fundamentalist and revisionist. The fundamentalists hold strongly onto the driving force of slavery as the cause of the Civil War and that such a conflict was inevitable (132). Revisionists, however, focus on other facets of Antebellum society such as the fragmentation of the Democratic Party (and thus the true two-party system) and the election of anti-slavery Abraham Lincoln as President as some major events leading to the tipping point. Both of these groups are correct, but not correct enough. 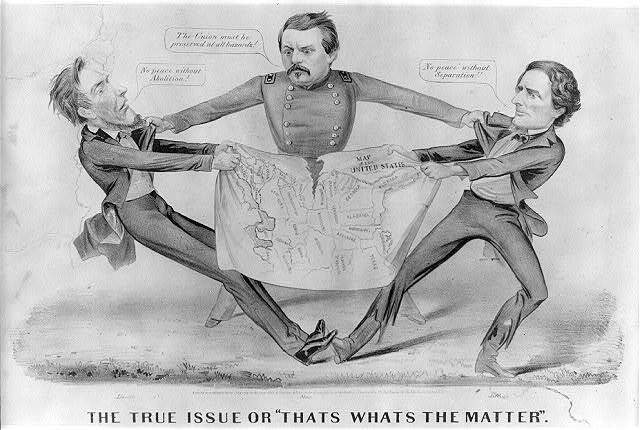 Ayers presents the case that the Civil War was a result of many different issues – all intertwined. Slavery was “the most profound [problem] the nation has ever faced’ (134), as it encompassed so many other facets of Antebellum society. In order to understand the causes of the Civil War, one must study history from that time’s perspective, not a modern one. Ayers calls this “deep contingency” (143) and emphasizes the necessity of understanding Antebellum society as a whole in order to truly know what caused the Civil War. One cannot simply answer the question of “what caused the Civil War?” especially with just one phrase such as “slavery” or “states rights”. As Ayers says, “History does not fit on a bumper sticker” (143). Tagged Ayers, fundamentalist, revisionist, secondary source, slavery, states rights, what caused the civil war?